1. a line through a center of a body, or about which a structure revolves. the second cervical vertebra. adj., adj ax´ial. 2. the position of the cylindrical part of a lens, used for correcting astigmatism; the range of values is from 0° to 180°. dorsoventral axis one passing from the posterior to the anterior surface of the body. electrical axis of heart the preponderant direction of current flow through the heart, a consequence of the electromotive forces within the heart. It may be computed on either an instantaneous basis or a mean basis. frontal axis an imaginary line running from right to left through the center of the eyeball. axis of heart a line passing through the center of the base of the heart to the apex. instantaneous electrical axis the electrical axis of the heart determined at a given point in time. lead axis the imaginary direct line between the two electrodes of the bipolar leads or between the positive electrode and the reference point of the unipolar leads. mean electrical axis the average direction of the activation or repolarization process during the cardiac cycle; it may be determined for any deflection (P, QRS, ST-T) and in the frontal, transverse, or sagittal plane. 1. a line connecting the center of the anterior curvature of the cornea (anterior pole) with that of the posterior curvature of the sclera (posterior pole). 2. the hypothetical straight line passing through the centers of curvature of the front and back surfaces of a simple lens. phlebostatic axis a point located by drawing an imaginary line from the fourth intercostal space at the sternum and finding its intersection with an imaginary line drawn down the center of the chest below the axillae. sagittal axis an imaginary line extending through the anterior and posterior poles of the eye. 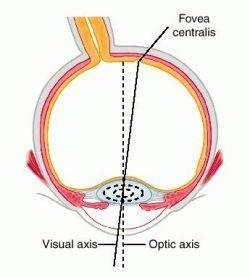 visual axis an imaginary line passing from the midpoint of the visual field to the fovea centralis. Axes of the eye. From Dorland's , 2000. (ak'sis, ak'sēz), Do not confuse this word with access. 1. A straight line joining two opposing poles of a spheric body, about which the body may revolve. 2. The central line of the body or any of its parts. 3. The second cervical vertebra. 6. An artery that divides, immediately on its origin, into a number of branches, for example, celiac axis. 1. a line through the center of a body, or about which a structure revolves; a line around which body parts are arranged. Axis. (A), (Top) transverse aspect; (bottom) superior aspect. (B), Position. basibregmatic axis the vertical line from the basion to the bregma. basicranial axis a line from basion to gonion. basifacial axis a line from gonion to subnasal point. binauricular axis a line joining the two auricular points. celiac axis see under trunk. dorsoventral axis one passing from the back to the belly surface of the body. electrical axis of heart the resultant of the electromotive forces within the heart at any instant. axis of heart a line passing through the center of the base of the heart and the apex. optic axis the hypothetical straight line passing through the centers of curvature of the front and back surfaces of a simple lens. 2. A center line to which parts of a structure or body may be referred. 1 (in anatomy) a line that passes through the center of the body, or a part of the body, such as the frontal axis, binauricular axis, and basifacial axis. 2 the second cervical vertebra, about which the atlas rotates, allowing the head to be turned, extended, and flexed. Also called epistropheus, odontoid vertebra. The second bone of the vertebrae (C2), which contains a distinct bony protuberance, the odontoid process (dens), on which the first cervical vertebra (C1, the atlas), which carries the head, rotates. During judicial hangings, the odontoid process typically breaks off and is forced into the medulla oblongata, which contains the cardiac, respiratory and vasomotor centres that control involuntary functions (e.g., breathing, heart rate and blood pressure), usually resulting in instant death. (1) A central or straight line between two structures. (2) A functional centre between two or more physiologically related activities—e.g., brain-gut axis, hypothalamic-pituitary-adrenal axis. Medtalk A central or straight line between two structures. See Brain-gut axis, Hypothalamic-pituitary-adrenal axis. 4. The central nervous system. 5. The second cervical vertebra. Synonym(s): epistropheus, vertebra C2, vertebra dentata. 6. An artery that divides, immediately on its origin, into a number of branches, e.g., celiac axis. 1. The second of the vertebrae of the spine, upon which the skull and first vertebra (ATLAS) can rotate. 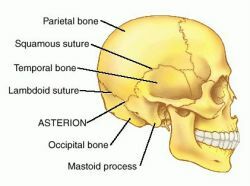 The axis bone has a short, stout vertical peg called the odontoid process around which the atlas can rotate. 2. An imaginary central line of a part or of the body. 3. The meridian in a CYLINDRICAL LENS that possesses no optical power. The curve of maximal power is at right angles to the axis. A line that passes through the center of the body or body part. n 1. an imaginary line around which motion occurs, as in an axis of rotation. 2. C2, the second cervical vertebra, around whose odontoid process the atlas rotates. See also atlas. n an imaginary line through the costovertebral and costotransverse rib articulations. n the imaginary line crossing between the sternum and the spinal column, about which the ribs rotate in bucket handle rib motion. See also axis of rib motion and bucket handle rib motion. n major component of the neuroendocrine system that controls reactions to stress and manages metabolic function; involves interactions of the hypothalamus, pituitary gland, and adrenal glands. n a hypothetical axis located at the junction of a frontal and the median-sagittal planes. See also vertical axis. n hypo-thetical axis for the nutation/counternutation of the sacrum, located horizontally through the front of the sacrum at the second segment. Proposed by osteopathic physician Fred Mitchell, Sr.
n See axis, middle transverse. n See axis, superior transverse. n movement of the sacrum around any of its axes. n hypothetical axis around which involuntary sacral movement is believed to occur during the craniosacral cycle. The axis passes through the articular processes behind the dura mater's attachment point in the second vertebral segment of the sacrum. Proposed by osteopathic physician Fred Mitchell, Sr.
y axis. See also axis, longitudinal. A real or imaginary straight line about which a body or system can rotate, or about which a body or system is symmetrical. achromatic axis A line in the eye along which light passes through all the optical elements and emerges without chromatic dispersion. Although it may lie close to the optical axis it does not necessarily coincide with it. See chromostereopsis; dispersion; chromatic parallax. anteroposterior axis A line passing through the anterior and posterior poles and the centre of rotation of the eye. It is perpendicular to the transverse (or x-axis) and the vertical (or z-axis). Torsional movements occur around this axis. Syn. sagittal axis; y-axis. See centre of rotation of the eye; poles of the eyeball; torsion. cylinder axis 1. A line of zero curvature on a cylindrical surface. 2. That principal meridian of a planocylinder in which the power is zero. See astigmatic lens. axis's of Fick Three mutually perpendicular axes which intersect at the centre of rotation of the eye. They are the x-, y-, and z-axes. Syn. primary axes of Fick. See vertical transverse anteroposterior axis; sagittal plane; xy listing's; yz plane. fixation axis The line joining the object of regard to the centre of rotation of the eye. Syn. line of fixation. geometrical axis The line passing through the anterior and posterior poles of the eye. If the refractive surfaces are symmetrical about that axis, it will then coincide with the optical axis. horizontal axis See transverse axis. axis notation See standard axis notation. axis notation, standard The accepted axis notation for cylinders, the same for each eye, whereby the specified axis direction denotes the angle of the cylinder axis with the horizontal measured anticlockwise from 0º to 180º, the front surface of the lens being viewed (British Standard). (Fig. A23) Syn. TABO notation (although the TABO notation specifies the axis direction from 0º to 360º); OCA notation. optical axis 1. The line joining the optical centres of the refractive surfaces of the eye (a theoretical concept in the eye). A close approximation of this axis is represented by aligning the Purkinje images of a test object (Fig. P14, page 284). 2. The line normal to the surfaces of a lens along which light passes undeviated. See Purkinje-Sanson images. orbital axis The line from the middle of the orbital opening to the centre of the optic canal. The orbital axes of a normal adult make an angle of approximately 45º with each other. See orbit. principal axis A line passing through the centre of curvature of a surface and through its vertex. pupillary axis The line passing through the centre of the entrance pupil of the eye and the pole of the cornea. Syn. pupillary line. See poles of the eyeball. sagittal axis See anteroposterior axis. 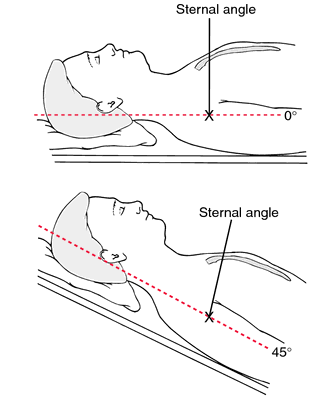 transverse axis A horizontal line passing through the centre of rotation of the eye and lying in Listing's plane. Syn. x-axis. See anteroposterior axis; Listing's plane. vertical axis A vertical line passing through the centre of rotation of the eye. Syn. z-axis. visual axis The line joining the object of regard to the foveola and passing through the nodal points which are often considered as coincident, as they are very close to each other. Strictly, this axis is not a single straight line as it consists of two parts: one line connecting the object of regard to the first nodal point and the other line parallel and connecting the second nodal point to the foveola. Syn. visual line. See line of sight. 1. [TA] Straight line joining two opposing poles of a spheric body, about which the body may revolve. 2. Central line of the body or any of its parts. 3. [TA] Second cervical vertebra. 6. Artery that divides, immediately on its origin, into a number of branches, e.g., celiac axis. n 1. a straight line around which a body may rotate. n 2. the second cervical vertebra, which articulates with the first (atlas) and third cervical vertebrae. n an imaginary line through the two mandibular condyles around which the mandible may rotate during a part of the opening movement. n the location of the condylar axis by fixing a face-bow rigidly to the mandibular teeth, having the patient open and close the jaws, and recording the most posteriosuperior points of pure rotation with tattoo ink on the outer skin. See also face-bow and hinge-bow. n one of three axes of the jaw condyles: (1) the hinge axis, an intercondyle imaginary line across the face through both condyles; whenever either condyle is chosen to be a rotator, it will display (2) a vertical axis, and (3) a sagittal axis. The hinge axis is a moving center for the opening and closing movements. The vertical axis is the center for the horizontal components of orbital movements. The sagittal axis is the center for the vertical components of orbital movements. n a craniofacial plane determined by three tattooed points. Two are located with one on each side of the face at the point of exit through the skin in front of the tragus of the imagined extended rearmost mandibular hinge axis. The third point is located on the right side of the nose at the level of the orbital rim just beneath the pupil when the patient is gazing directly forward. This plane corresponds to the anthropologic Frankfort plane. n an imaginary line passing longitudinally through the center of a body. n the path taken by a restoration as it slides on or off the preparation. n.pl the movements projected on the axis-orbital plane in gathering the input data for an articulator. n the imaginary line around which the working condyle rotates in the frontal plane during lateral mandibular movement. The sagittal and vertical axes function concurrently. n the imprecise term used before the nine different directionalized laterotrusions were discovered and named. n the imaginary line around which the working condyle rotates in the horizontal plane during lateral mandibular movement. The sagittal and vertical axes function concurrently. n (cephalometric axis), the angle of a line connecting the sella turcica and the gnathion and related to a horizontal plane. An indicator of downward and forward growth of the mandible. genus of deer in family Cervidae. 2. the second cervical vertebra. one passing from the back to the belly surface of the body. the resultant of the electromotive forces within the heart at any instant. See also mean electrical axis. 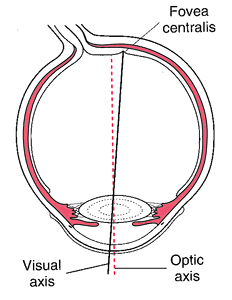 the optical axis that connects the anterior and posterior poles of the eyeball. Called also optic axis. an imaginary line running from right to left through the center of the eyeball. a line passing through the center of the base of the heart and the apex. see external bulbar axis (above). a line passing through the apex of the bony orbit and the center of the opening of the orbit. an imaginary line extending through the anterior and posterior poles of the eye. an imaginary line passing from the midpoint of the visual field to the fovea centralis. Conserved mechanisms of dorsoventral axis determination in equal-cleaving spiralians. Specification of the dorsoventral axis and mesentoblast formation in nemertean and flatworm embryos show similarities and differences compared to molluscs and annelids and to each other. Trochoblast and mesentoblast specification (coupled to dorsoventral axis formation) in molluscs and annelids strengthens the idea of a close phylogenetic relationship between these phyla. Are quadrant identities and the dorsoventral axis in nemerteans established late by virtue of cell-cell interaction, as in other equal-cleavers, or are they set up precociously as a consequence of the early cleavage divisions, perhaps relative to some underlying axial properties?